Do you like animals in your stories? I’m not talking about novels about animals, like Black Beauty or Beautiful Joe, although I did love Marley and Me and All Creatures Great and Small. I’m not talking about shape-shifters either, although Kathryne Kennedy does a fabulous job making you believe that people can turn into horses and lions in her Relics of Merlin series. I’m talking about animals as companions (or sidekicks, if you will) or even crime-solving felines like the ones Lillian Jackson Braun writes about in her Cat Who series. Dogs and cats, even horses and other creatures that bring something special to a story (I recently finished writing a novel where the heroine owned a sea-faring cat – or should I say the cat owned her as we all know, one never owns a cat-the cat decides you are worthy to be his/her companion). There is a dog in my current novel in progress, not a crime solving dog but a faithful friend and protector. 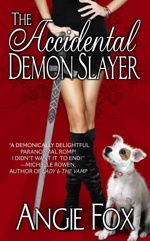 Angie Fox has Pirate, the talking dog (granted, only Pirate’s owner can hear him) in The Accidental Demon Slayer (I admit, I love this dog!). Lisa Kleypas has all kinds of critters in her Hathaway Series (which I love). I’m an animal lover. Have been all my life – just can’t seem to help myself – and I love it when an author includes a furry, four-legged companion in a story. What are some of your favorite books that feature an animal as sidekick? I love animal companions in books. In fact, one I have out on submission now has a dog as the companion. Dark Rivers of the Heart, by Dean Koontz is one of my favorites. I spent the whole book saying, "don't hurt the dog, don't hurt the dog." LOL! I'm with you, Ladies! I always root for the animals and nothing makes me cry more than seeing an animal get hurt (the commercials for ASPCA choke me up and I want to adopt every one of them). 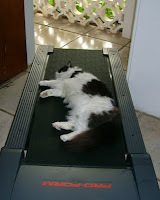 Alexis, I love the pictures of your baby sprawled on the treadmill and laptop! Is he helping you write your next novel? Hi Marie, I wouldn't say that Giz is helping exactly. Making me laugh, yes. Being helpful, no :-) Though I guess if I can't use the treadmill because he's "using" it, that does give a me a good excuse not to exercise, right?